Southeast Lauderdale Middle School: Latest News - #Challenge39 starts Monday! Public schools in Mississippi are funded based on attendance instead of enrollment. October and November are the months taken into consideration for funding. Therefore, it is important for us to maximize our attendance during those months. To be considreed "presnet" under Mississippi law, a student must be in school 63% of the day. We encourage you to make all appointments after or before school hours if at all possible. Furthermore, research tells us school attendance is a significant indicator of success in school. Free Dress - A student will have free dress up until the point that they miss a day (63% of the day). This starts over each month. Students who have Perfect Attendance for both October and November will also have free dress through December. 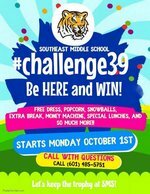 Extra Breaks - If your student's grade level has a 98.5% daily attendance average, the entire grade level will get an extra afternoon break, along with random prizes and snacks during regular break time. Special Lunch - One student per week will get to have lunch with the principal if he or she has improved his/her attendance. Money Machine - Every week a random student from each grade level and with perfect attendance will get to get in the money machine! Additional Prizes - "Dance Party" with DJ Jigga JT will be held at the end of October. Free Fall Festival tickets for students with perfect attendance at the end of November. For further information please call the school office.